Illite is essentially a group name for non-expanding, clay-sized, dioctahedral, micaceous minerals. 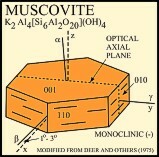 It is structurally similar to muscovite in that its basic unit is a layer composed of two inward-pointing silica tetragonal sheets with a central octahedral sheet. 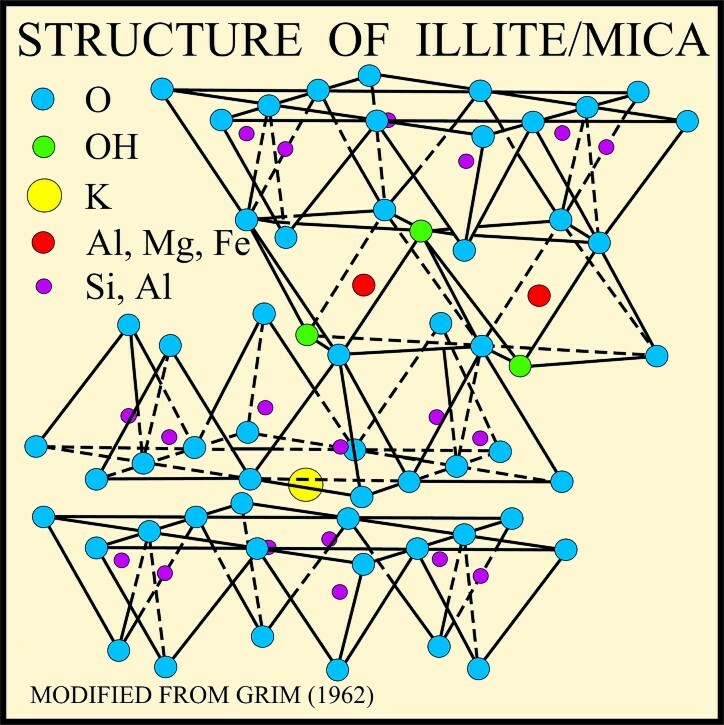 However, illite has on average slightly more Si, Mg, Fe, and water and slightly less tetrahedral Al and interlayer K than muscovite (Bailey, 1980). 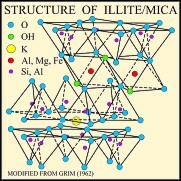 The weaker interlayer forces caused by fewer interlayer cations in illite also allow for more variability in the manner of stacking (Grim, 1962). Glauconite is the green iron-rich member of this group. 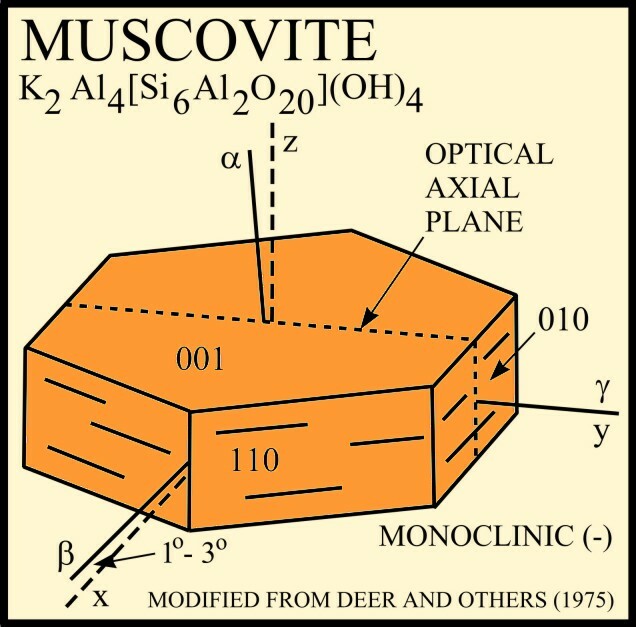 Illites, which are the dominant clay minerals in argillaceous rocks, form by the weathering of silicates (primarily feldspar), through the alteration of other clay minerals, and during the degradation of muscovite (Deer and others, 1975). Formation of illite is generally favored by alkaline conditions and by high concentrations of Al and K. Glauconite forms authigenically in marine environments and occurs primarily in pelletal form. Members of the illite group are characterized by intense 10-angstrom 001 and a 3.3-angstrom 003 peaks that remain unaltered by ethylene glycol or glycerol solvation, potassium saturation, and heating to 550 degrees C (Fanning and others, 1989). 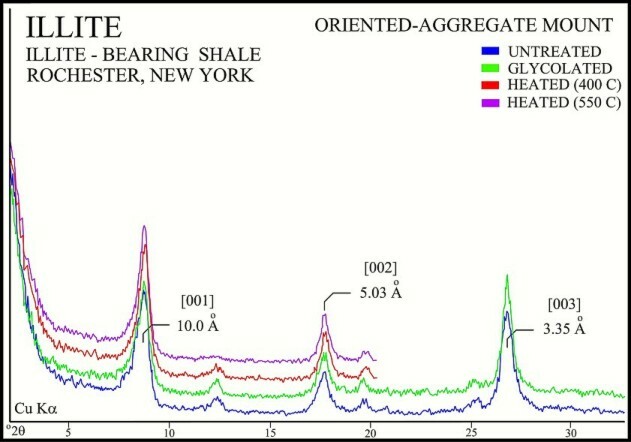 Glauconite can be differentiated from illite by a 1.5- to 1.52-angstrom 060 peak (illite's 060 peak occurs at 1.50 angstroms), and by the presence of only a very weak 5-angstrom 002 peak.